It's a cliche, but in this instance true: The only limits are your imagination. If you’re the type of person who wants your computer keyboard to tell you when your garage door is open, or when you’ve received an email from your wife, or when the President-Elect tweets at 3:00 a.m., Das Keyboard has the ultra-programmable keyboard for you. Dubbed the Das Keyboard 5Q, the $229 keyboard is a crazy mashup of traditional mechanical Gamma Zulu-powered switches, the cloud, and programmable apps such as Zapier and IFFTT. If you’d like your number keys to visually indicate the level of your PC’s CPU activity, that’s entirely possible. 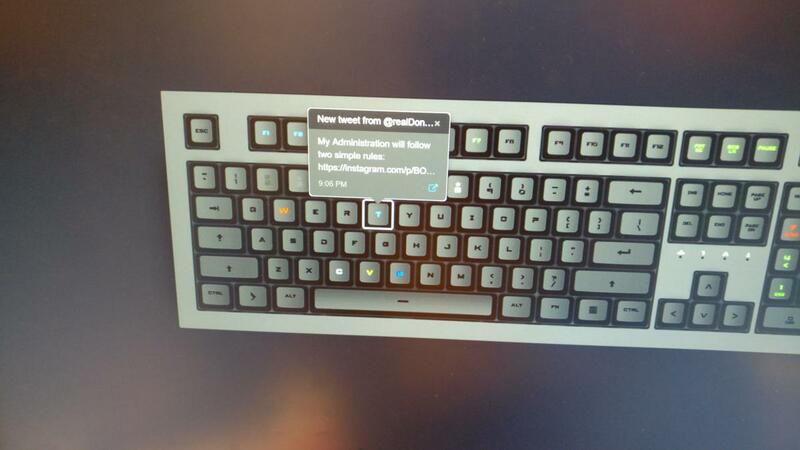 Basically, every key on the keyboard is a “macro” key, and can be reprogrammed as its own individual indicator. Das Keyboard has been around for years, primarily focused on the sort of mechanical keyboards that many PC users prefer, for their satisfying keystroke action and long life. That’s still the case, as each switch on the 5Q is rated for 100 million keypresses, according to the company. The 5Q is available in both 104- and 105-key layouts, including the U.S., UK, and German layouts. At 2 pounds, 12 ounces, it’s pretty sturdy, too. Likewise, the 5Q preserves features that you’ll find elsewhere: There’s a gaming mode that disables the Windows key so that you don’t accidentally bring up your Start menu. A keycap puller is included for replacing keys, although the 5Q's keys are made to reveal the RGB backlight behind each one, which can push over 16 million colors. The 6.5-foot braided USB 2.0 cable plugs into your PC. Tap the dedicated Q knob, and the app opens. Here you can see why your programmable key was signalling you. The 5Q also sports one extra key: the “Q” button at the upper right, which acts as both a volume knob as well as a configuration button for the associated “Q” app for iOS and Android. The Q app allows you to check your signals—what did Trump say? Opening the app on your PC will quickly show you what data lies behind that indicator—is your “W” key flashing red to indicate that your site is down? If you have it programmed correctly, opening the app could provide supplementary data. 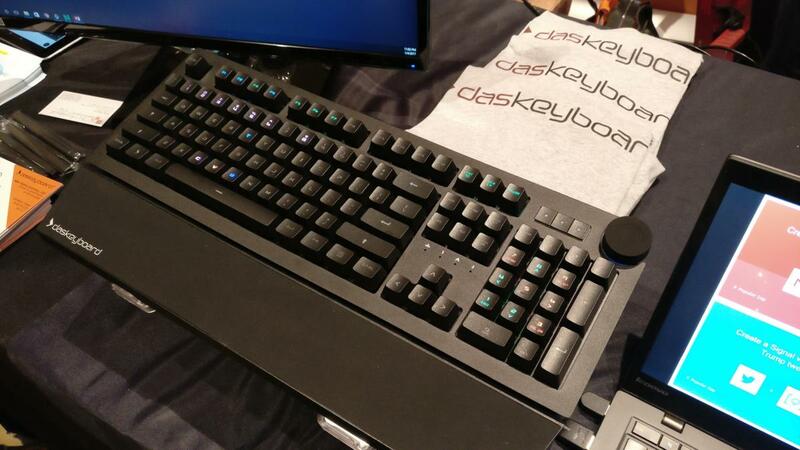 Das Keyboard’s 5Q originally started off as a Kickstarter project, but having raised five times its funding goal, company executives say it’s now on track to be produced in March.